There are several ways to create a contact in Google and add to your business clientele. Contacts are created automatically when you send e-mail in Gmail. You can add them through Google Voice or Gmail and other Google products when you see an e-mail address or phone number that isn’t yet in your contacts. 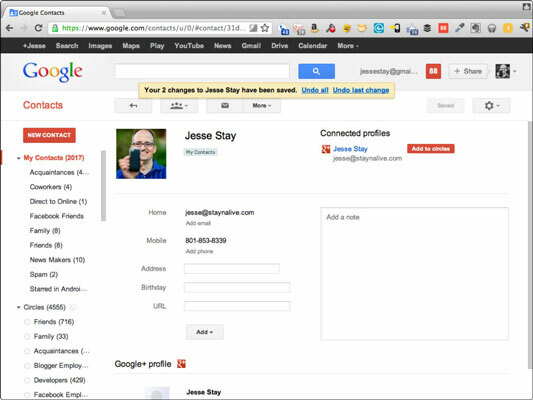 Or you can go to Google contacts and create one from scratch there. A list of all your contacts appears. Play around and learn what’s available here. Click the big red New Contact button. The button currently appears in the upper-left part of Google Contacts. That may change in the future as Google changes its interface. Add all the information you can. On the page that follows, you can enter all the information you may have about your new contact, such as a profile image, e-mail address, phone number, address, or notes about meetings. Your contacts are saved automatically as you add information, but you can also explicitly click the Save Now button to save your information at any time. Either way, your contact is saved and in your database. If you add just one piece of information that someone already has in his or her public Google+ profile, the other blanks in your contact information on that person fill in automatically. To try out this feature, enter Jesse Stay as the name and then add jesse@staynalive.com as the e-mail address. Immediately, the Google+ profile picture and other public information will be added to your contact without your having to add anything else. Save the contact, and you’ve got Jesse in your contacts for speaking engagements and future consulting opportunities.